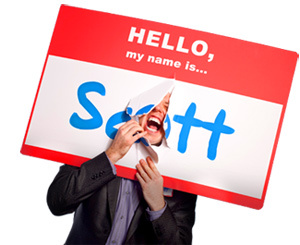 How to Turn Vulnerability into Profitability - HELLO, my name is Scott! Wearing a nametag 24-7 for the past 3,000+ days has been great practice. Practice being vulnerable, that is. And as I continue to reflect on the past nine years of adhesive adventures, I’m slowly starting to realize the connection between vulnerability, approachability and profitability. HERE’S THE REALITY: Sticking yourself out there is a risk. And vulnerability is about being open. Revealing your personhood to the world. Submitting your ideas, thoughts and passions for all to see. Surrendering your Truth – weaknesses and imperfections included – to the people around you. This, of course, is terrifying for many people. Because you’re risking your truth. You’re risking being rejected. And you’re risking being stared at or talked about. FIRST: The more often you stick yourself out there – that is, exert your distinctiveness – the more comfortable and confident you become with who you are. THEN: When you’re comfortable and confident with who you are, your truthful self-expression inspires and gives other people permission to do (and BE) the same. EVENTUALLY: When you and the people in your life stop bullshitting each other – and start realizing that it’s OK to be vulnerable – the rules change. We begin to listen to each other from a truer place. We start to share with each other from a stronger place. We now communicate with each other from a more genuine place. As a result, employees will listen TO you, and customers will buy FROM you. Sounds like profit to me! What about you? Are you ready to reclaim your right to be vulnerable – and LEAD with it? In his classic discourse on self-disclosure, The Transparent Self, Sidney Jourard hits the topic of vulnerability pretty hard. I read this book in college, only two years into my nametagging adventures. And I’ll always remember it as one of the first books that taught me what it meant to be approachable. LESSON: Being vulnerable educates others about who you are. QUESTION: How well do your customers know YOU? ACTION: Fully integrate your humanity into your profession. Five ways to do so here. LESSON: Being vulnerable is a gift that you give to others. QUESTION: How, specifically, are you giving the gift of YOU? ACTION: Ask PFQ’s (Passion Finding Questions.) I posted a list of them here. LESSON: Being vulnerable means being open to the fact that not everyone will like you. QUESTION: Are you willing to let go of the need to be liked by everybody? ACTION: Learn who (not) to listen to. Consider tuning out these 100 types of people. LESSON: Being vulnerable is a great way to get to know who you really are. QUESTION: What have you learned about yourself by virtue of sharing yourself? ACTION: Start blogging today. Shatter your excuses for not blogging here. REMEMBER: Sticking yourself out there – that is, being vulnerable – is a risk. What’s more, vulnerability requires confidence in yourself, implies security in yourself and suggests openness to others. So, contrary to popular conditioning, vulnerability IS strength. And we live a lie when we misrepresent the reality of our experience or the truth of our being. I challenge you to open the door to your Truth. To risk feeling what you feel. To come out of the closet. It makes you more relatable. It makes you more approachable. And ultimately, it makes you more profitable. 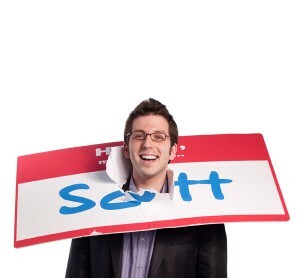 And you don’t even need to wear a nametag everyday. What are you using your vulnerability for? For the list called, “24 Daily Practices for Turning Vulnerability into Profitability,” send an email to me, and I’ll send you the list for free!